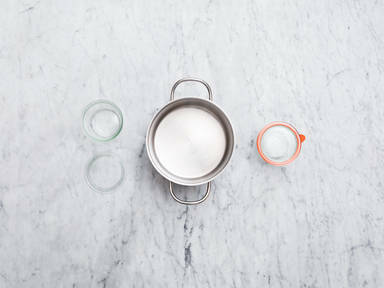 Transfer lids to a deep baking dish. Bring water to a boil and fill jars and the baking dish with it. Pour off hot water and let jars and lids dry on a clean kitchen towel. Bring water to boil in a large pot. Add jars and lids to the pot and let simmer for approx. 10 min. Remove jars and lids from the pot and let dry on a clean kitchen towel. Preheat oven to 120°C/250°F. Transfer lids to a deep baking dish. Bring water to a boil and fill jars and the baking dish with it. Pour off hot water and let jars and lids dry on a clean kitchen towel, then transfer them onto an oven rack. Don't place rubber bands or metal clips in the oven. Let the jars and lids rest in the oven for approx. 15 min, then carefully remove from the oven and let cool down.